It's probably not just to combat gridlock. And now, we get to add one more item to the list. Starting next year, China will require all newly registered cars to be equipped with highly trackable RFID tags, the Wall Street Journal reports. RFIDs are the same technology used to check if you’re paying highway tolls in the U.S. like EZ Pass. While that sounds harmless enough, it likely means that, every time a driver passes a checkpoint, the government will have that person’s location and identifying information. And the fact that it’s mandatory won’t give anyone the chance to opt out. If you want to drive a car in China, you’ll have to give up information on where you are at a certain point in time — or not drive at all (and have your face scanned on the street). RFID chips are only able to track which car passes which point — a mass of cars won’t appear as moving blips on a GPS screen at the Chinese surveillance-state HQ. But it does mean the state will have an unprecedented level of detail about who you are, your car, and where you’re going if you happen to pass a checkpoint. Authorities at the Ministry of Public Security have a seemingly simple reason for introducing these so-called “electronic license plates”: the government wants to track cars to ease traffic congestion and help with public security, according to the Wall Street Journal. Easing congestion? It’s as if they’re not trying to come up with good reason to track people anymore. 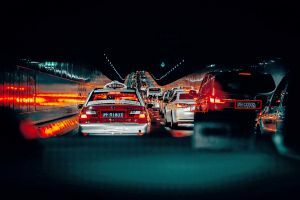 Effectively monitoring traffic in a city requires technology limited to radar systems and checkpoints equipped with sensors that count the number of vehicles. Understanding traffic congestion doesn’t require any personal information like car registration data, so obviously something much larger is driving this new scheme. Like, say, near-total surveillance. And, as Quartz points out, the RFID program is not even the most intrusive of these surveillance schemes. Xinjiang province made a GPS tracking system for cars mandatory last year — especially troubling, in light of targeted ethnic violence against the largely-Muslim Uyghur population living in the province. Identifying and tracking vehicles’ movements, then, will definitely increase the state’s ability to spy on its own people. No matter whether it’s in the name of public security or just an erosion of their individual rights, the people of China will either have to submit their information, or face the consequences. And for most, those consequences might be too dire to risk.